Most car companies try to create vehicles that vary enough in price range and power output to reduce rivalry within the brand, yet can remain competitive against others. Acura’s vehicle lineup is a simple one: there are the two SUVs, the RDX and larger MDX, and then you have its three sedans, the TSX, TL and RL. Acura’s major dilemma is that its middle-child TL received a serious upgrade for 2009, with its all-wheel drive model now matching or besting Acura’s flagship luxury sedan, the RL, in power, size and amenities. The TL also comes in at $8,000 less than the RL, begging the question why anyone would buy the RL besides a preference over the exterior styling. Don’t get us wrong, there are plenty of great qualities about the RL. Its cabin space is luxurious and, despite it having roughly the same passenger volume, feels more spacious than the TL’s, providing more comfort for the discerning driver. There are also a few standard tech options that TL buyers won’t have access to without opting for an optional package. And against the competition, it holds up well, providing good bang for the buck without sacrificing luxury. It’s just a shame that its main rival seems to be from within its own ranks. Mutiny! The RL features a great interior, with all the appointments you expect in a car at this price. Super-Handling All-Wheel Drive (SH-AWD) keeps the car rooted to the ground through corners and on slick surfaces. The body style is dynamic enough to be interesting but remains on the safe side of design – perfect for those who want to fly under the radar. It’s time for the RL to get a serious power upgrade or something else to drastically distinguish itself from the TL. Originally designed during a time when economy wasn’t an issue, this car can really guzzle its gas despite having the same engine as more fuel-efficient Acuras. Yes, a more robust engine would be beneficial to the overall Acura lineup, but the V-6 does do an impressive job of moving a car tipping the scales at 4,000 lbs. With the help of the SH-AWD system, the RL boasts smooth acceleration and a comfortable drive. There’s little road noise and even less wind noise as you drive along. Highway cruising is a little noisier due to the lack of a sixth gear – a feature that, if added, would greatly help fuel economy. Sport mode reduces body roll and extends the revs for a longer period of time, leading to more fun on twisting roads. Steering provides on-point feedback too, shirking the general tendency for some luxury sedans to deliver numb and non-engaging handling. 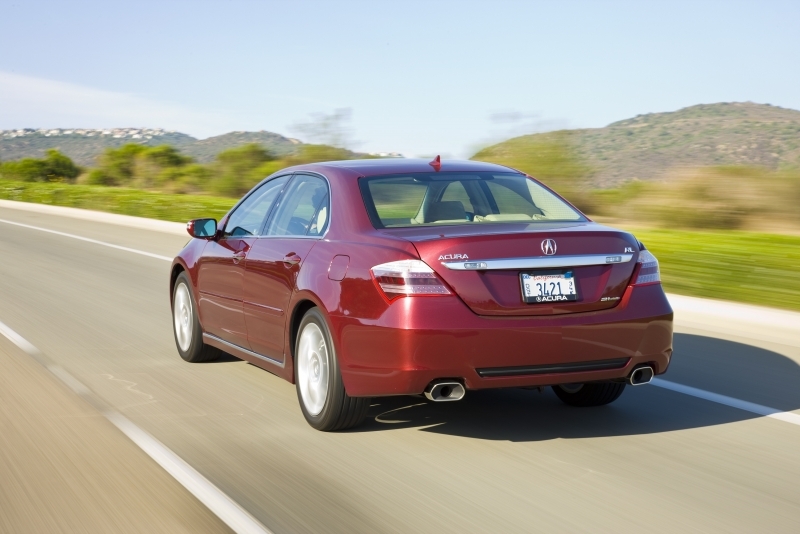 Featuring a 3.7-liter VTEC V-6 engine, the RL produces 300 horsepower and 271 lb-ft of torque. This is on par with the rest of the segment, as is the standard AWD, which allocates power to the wheels depending on vehicle and road conditions. The five-speed automatic transmission is the only one on offer for the RL. While most cars have a base audio system and an optional upgrade package, Acura gives you the best right out of the box. A 260-watt Bose Surround Sound System fills the cabin with sweet (or salty) music, which only falls short on low-end bass. On the convenience side of things, adaptive cruise control is available for those who want to set a speed and let the car do the rest. It will apply brakes or throttle to keep you at a predetermined distance from the rest of the traffic. You’d be surprised to learn how much tech is in the RL, considering how well it integrates within the cabin. The optional navigation system is incredible, giving you real-time weather and traffic as well as Zagat restaurant ratings with just a few pushes of a button. But the system has a fatal flaw: its looks. The interface simply looks cheap and outdated. Once they upgrade that, Ford’s Sync may have a rival on its hands. Bluetooth connectivity and a USB interface also come standard. Due to the lack of a sixth gear and the extra heft of the all-wheel drive system, the RL – getting 16 mpg city, 22 highway – falls under the average mark for mileage numbers, especially on the highway. The ULEV-II emissions rated sedan also takes Premium Unleaded. Oops, there go a few more dollars at the pump. In a sedan that has standard leather seating and integrated sunshades in the rear windows, you can safely assume the rest of the cabin follows suit. Luxuriously appointed seats are a joy to sit in – even for hours at a time – and the rear has enough legroom for three adults to comfortably ride along. The 13 cubic feet of trunk space will be ample enough for most journeys. Design cues are more subtle in the RL than the rest of the Acura clan, and appropriately so. The protruding nose is the only standout feature thanks to the razor-shaped grille and notched-out hood. 18-inch alloys come standard to balance out the length of the car. 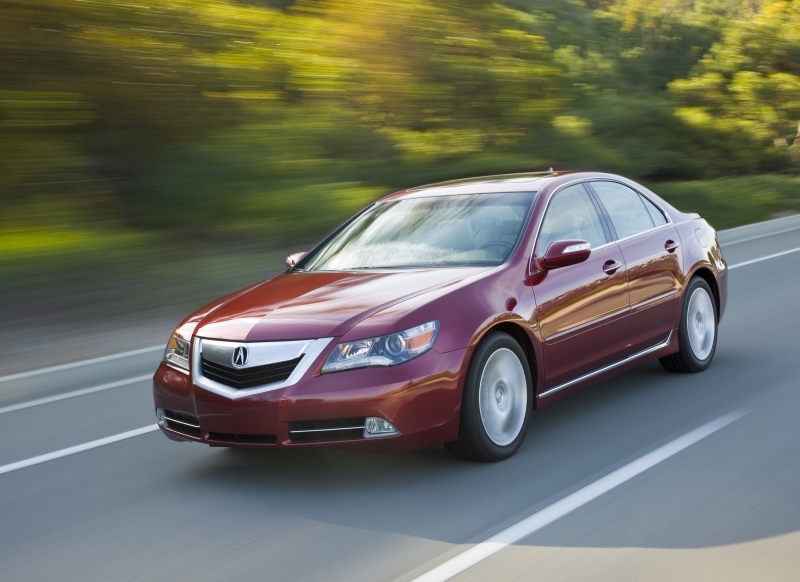 The $46,680 starting price puts the Acura RL in line with a number of luxury sedans. Its direct rival, the Lexus GS 350 AWD, comes in at a very close $46,950, while other like the Audi A6 3.0T and BMW 535i see prices a couple thousand higher. If budget is a priority, stick close to similar cars like the Cadillac STS and Lincoln MKS AWD. There may be some infighting between Acura models, but there’s no doubt that the RL is a fine car in its own right. A smooth drive and luxurious cabin space keep both the driver and passengers at ease, while the latest technology adds security and comfort. 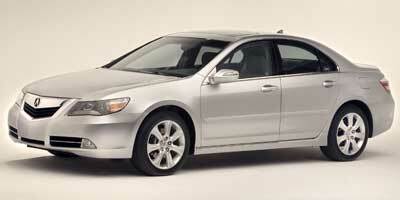 Priced well within its segment, the 2009 Acura RL should meet most people’s needs without breaking the bank.